Are Fyfe's Brownlow hopes in jeopardy? Is Brownlow Medal favourite Nat Fyfe in trouble for this bump? North Melbourne with a gutsy win kicking five goals to two in the last quarter. Cunnington with a team high 26 disposals for the Kangaroos including 15 contested possessions and six clearances. Higgins and Harvey both with shots on goal that fail to impact the scoreboard. The Kangaroos have been very effective with their disposal this last quarter, continuing to run at above 80 per cent disposal efficiency. All four of the Kangaroos goals have now come from turnovers this quarter as Harvey kicks his fourth. Ten of North Melbourne's 13 goals has been generated from turnovers today. The last Bastinac clearance stops a run of four consecutives clearances for the Dockers. North Melbourne is leading the scoring this quarter 3 goals to 1 despite the Dockers leading inside 50s 87 and clearances 7-2. North Melbourne have started the first half of the last quarter with a huge amount of run leading the uncontested possession count 3016. Both the Kangaroos goals have come from turnovers this last quarter as Goldstein both roves the contest then provides the scoring option to get a goal back on Sandilands. Brown strikes back quickly for the Kangaroos on the back of a strong contested mark. 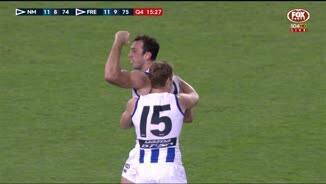 Brown has now taken three contested marks for North Melbourne, a team high. 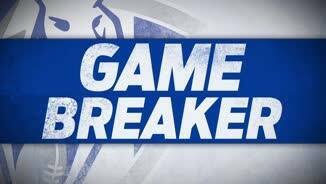 A very costly turnover from the North Melbourne kick in as Mzungu spots up an unmarked Griffin for his second goal of the match. The scene is set for a great last quarter as the Kangaroos reduced the margin to six points at the last break having kicked 3 goals to 2 that quarter despite the Dockers leading the inside 50 count 128. For the second time this quarter the Kangaroos transition the ball from defensive 50 to inside 50 for a goal as Nahas kicks his second. Nahas continues to lead all players in score involvements with nine, a season high. Nat Fyfe reported for high contact on Jacobs. Fremantle is maintaining the edge over North Melbourne on the scoreboard on the back of leading the contested possession count 9381, clearances 27-17, and inside 50s 37-27. 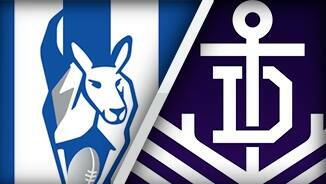 Dockers InterchangeLee Spurr off due to the blood rule. Kangaroos InterchangeJarrad Waite off due to an injury. Welcome to Etihad Stadium for the North Melbourne v Fremantle Round 21 clash. 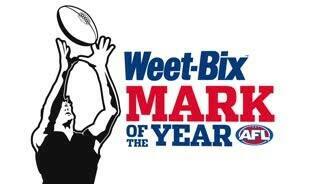 BROWNLOW Medal favourite Nat Fyfe was reported and North Melbourne has all but cemented its grip on a finals berth in a dramatic 11-point win over Fremantle at Etihad Stadium on Sunday. The Kangaroos were outplayed in the first quarter but worked their way back into the game before storming home with a late blitz that secured the 14.10 (94) to 12.11 (83) win. The win puts North eight points and almost 10 per cent ahead of ninth-placed Geelong with two rounds to play. In a blow to his Brownlow Medal hopes, Fyfe was reported after he clattered into tagger Ben Jacobs and made high contact from front-on as both players went for a loose ball in the third quarter. North coach Brad Scott hailed the maturity and poise of his players for holding their nerve after the Dockers' opening salvo. "Any time you play the top team on the ladder and you're 24 points down at quarter-time, if you get over the line it's generally a win full of character," Scott said. "I'm pleased that the players and coaches were able to maintain the faith." Todd Goldstein battled Aaron Sandilands all afternoon in a fascinating ruck duel but bobbed up with two crucial goals - including the last major of the game. Brent Harvey finished with four goals, while Andrew Swallow, Ben Cunnington and Nick Dal Santo were important through the middle in the absence of suspended onballer Jack Ziebell. 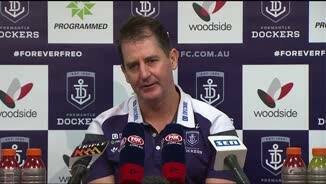 With skipper and leading goal-kicker Matthew Pavlich out with an Achilles injury, Fremantle kicked seven goals in the opening term but struggled to find reliable avenues to goal from then on. Lachie Neale provided the spark for the Dockers in the first quarter with 12 possessions and finished with 29 touches, while Sandilands had 43 hitouts and also kicked a couple of goals. Fyfe struggled to shake Jacobs at times and didn't have his usual influence. The Kangaroos' intensity around the contest lifted sharply in the second term and they made it harder for Ross Lyon's men to transition quickly through the middle, with Michael Walters kicking their only goal as the margin narrowed to 13 points at halftime. The quality of the football after the restart wasn't befitting two sides with lofty ambitions but the scrap suited North who clawed the deficit back to six points. Jon Griffin stood tall to mark and kick the first goal of a frantic final term but the Kangaroos surged to the lead with the next three before holding out the ladder leaders. "It was a frustrating day," Lyon said. "I thought we had plenty of opportunities to be in a more commanding position. 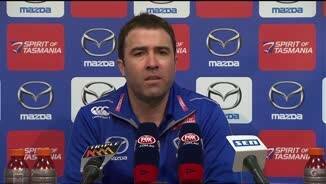 "I thought in the third quarter ... we should have gone three or four goals up, (but) it was just comedy capers or turnovers, missed handballs, misses (for goal) from 20m, dropped marks, kick-ins over the line - in the end it takes a bit of a toll."